Effects of Second Hand Smoke, What is the Danger? The effects of second hand smoke are pretty serious. They are much worse than just having a sensitivity to smoke. Of course, exposure to second hand smoke can cause all the allergy like symptoms: wheezing, coughing, sneezing, watery, red eyes, and a runny or stuffy nose. Do you know what's in this thing? We talked about this in our cigarette smoke allergy article. You can read it to find out more about a smoke allergy. These symptoms are very inconvenient. However, breathing second hand smoke can cause many problems more serious than those. It can cause life threatening health problems. It is a combination of mainstream and sidestream smoke. Mainstream smoke is the smoke inhaled and then exhaled by a smoker. Sidestream smoke is the smoke given by burning tobacco. This combination of smoke is also called Environmental Tobacco Smoke (ETS). Tobacco has chemical added to it so that it burns longer and doesn't go out while it is burning. As a result of these additives, tobacco smoke has over 4000 different chemicals in it. Of these around 40 or so are believed to cause cancer. Some of these chemicals are arsenic, formaldehyde, and cyanide. These are pretty toxic poisons. The EPA listed ETS as a Group A carcinogen. This is the EPA's worst list. It includes things like asbestos, radon, and benzene. Everything in Group A is known and can be proven to cause cancer in humans. You can read what the EPA says here: Setting the Record Straight. Among the effects of second hand smoke are some very bad things. 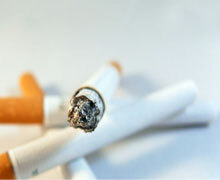 In adults it has been linked to lung cancer. According to the EPA, there are about 3000 cases of lung cancer every year attributed to ETS. Of these 800 are in people exposed to smoke at home. The rest are exposed in the work place or in social situations. There is also some evidence that it is linked to heart disease in adults, too. The EPA cautions that the risk of cancer is small, but it is still present. In children, however, the effects are much worse. Second hand smoke can cause breathing problems. These are respiratory tract infections like bronchitis, pneumonia. 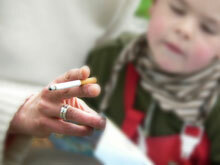 Between 150,000 and 300,000 children develop these conditions each year as a result of passive smoking. Out of these 7,500 - 15,000 are serious enough to make them go to the hospital. It also causes asthma. It's estimated to cause about 20,000 new asthma cases a year. It also is responsible for making the symptoms of asthma worse. Up to 1,000,000 children with asthma have more symptoms because of ETS. An increase in the chance of sudden infant death syndrome. Some researchers believe it increases the chance of SIDS by 4 to 6 times. Increase in the number of middle ear infections. There are many catastrophic effects of second hand smoke. It is not as bad for adults as smoking itself is. In addition to causing hay fever symptoms it can cause cancer. Who is doing the smoking? In children the effect are even worse. It causes life threatening diseases. Show your kids love. Try to avoid all second hand smoke. Don't allow people to smoke in your house. Avoid crowded restaurants full of smokers. Avoid any place where people smoke. Sometimes you can't totally avoid it. Your neighbors may smoke and it seeps into your apartment. If you can't avoid the source of tobacco smoke, get an air purifier. These will help to remove the harmful chemicals from the air. We recommend an air purifier with a HEPA filter and a larger amount of carbon. Austin Air Purifiers have a HEPA filter and 15 pounds of carbon. The activated carbon will remove both the smoke and the smell of smoke. We have reviews of many air purifiers on this site. Take the time to read them and let us help you to pick the best one. Leave Effects of Second Hand Smoke Page and Return to Air Purifiers, Asthma, and Allergies Page. Leave Effects of Second Hand Smoke Page and Return to All About Air Purifiers Home Page.